At 11am we were a few miles out from the coast of North Wales where the fields were all coated with snow. And at 12pm we passed the last point of land and bid good bye to Blighty with her snow clad mountains. In England in March 1919, an Australian soldier, John Gordon Campbell, stepped on board the troopship HMAT Khyber, bound for Australia. After four long years with the army during which Campbell served at Gallipoli and on the Western Front, perhaps the most important – or at least the most longed for – part of his war service was the journey home. This week’s object of the week is Campbell’s personal diary of that voyage. Campbell, an iron moulder from NSW, enlisted in October 1914, only two months after the commencement of World War I. He spent almost his entire service with the 4th Battalion, an infantry unit that was involved in some of the most significant and bloody battles in Australian military history – including the landing at Gallipoli on 25 April 1915 and the Battle of Amiens on the Western Front in August 1918. On 7 May 1917, in heavy fighting on the Hindenburg Line near Bullecourt, France, Campbell’s conduct earned him the Military Medal for bravery. The citation for his award reads: when in sole charge of a platoon this NCO showed the greatest judgement in handling the men. The trench was under a heavy bombardment for 24 hours through which Cpl Campbell patrolled the trench at frequent intervals and kept his men in hand by his coolness and courage. He himself had been previously buried by shell fire and severely shaken. Due to Australia’s distance from Europe and the Middle East, soldiers such as Campbell faced a long sea journey to get to the central theatres of the war and back home again. Overall around 330,700 members of the AIF embarked from Australia for service in WWI with considerably less making the return journey, ending their days in the cemeteries of foreign lands or remaining behind to settle in England or Europe. Still, by the end of the war official historian Charles Bean writes that there were an estimated 165,000 troops waiting to be repatriated back to Australia from the UK – a journey that took nearly two months. For John Gordon Campbell the cessation of hostilities came as welcome news, however Australia and home were still a long way away. So we have had a splendid trip up till now. So different from the last two I had at sea, where I passed along here (the African coast) three years ago, when we were always on the lookout for submarines. 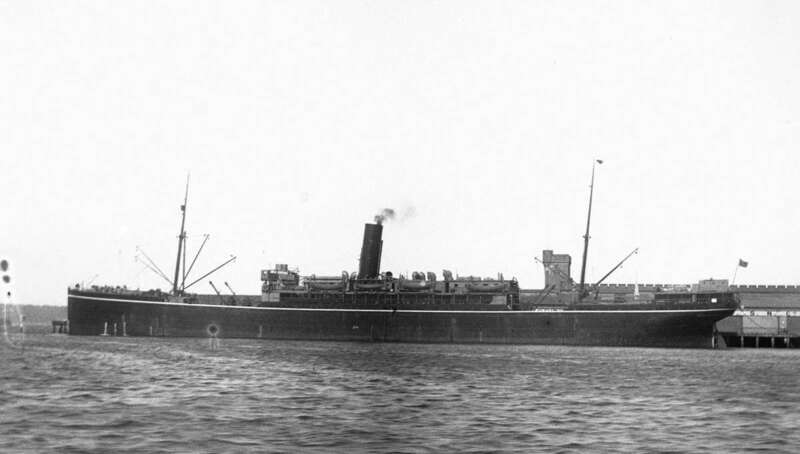 KHYBER as a commercial passenger liner in 1923 in Circular Quay. Object number 00040925. Additionally, although in 1919 returning troops were no longer at risk of enemy attacks along sea routes, there were still other dangers present. Most significantly, the end of World War I and the resulting mass migration of people and troops coincided with a devastating worldwide influenza epidemic. When it came to infectious disease, each troopship was a hazardous contained environment, particularly for the long voyage to Australia which provided plenty of opportunity for viruses to develop and spread. Each vessel was thus subjected to shore quarantine, isolation and inoculations – not just for influenza but also for illnesses such as small pox and cerebrospinal fever. Campbell describes these issues in his diary and relates the story of a man who cut his own arm to avoid another needle, hoping to make it look as though he had already had his vaccinations. Campbell also writes of his concern that the voyage home will be delayed due to quarantining when a man on board is diagnosed with small pox. The length of the journey to Australia required inventive ways of keeping the troops entertained. Shore trips were longed for as an opportunity to purchase souvenirs, buy food, socialise and to ‘stretch our limbs’. The long hours of Campbell’s voyage were filled by card games and brightened by sports and dances. A band performs regularly and a gramophone plays well into each night. The old gramophone gets so much use that Campbell is pressed to write that I hope when I get off this boat that I don’t hear a gramophone again as I have had enough of them to last me for the next twenty years. He observes the harbours of Port Said and Colombo, their people and their activities as the vessel slowly makes its way home to Sydney. Campbell’s diary makes little mention of his active service, of Gallipoli, the trenches or the act that led to his gallantry medal. The journal is a quiet record of the ‘delightful trip’ home, of the joys of the sun and a warmer climate. Campbell describes the daily life on a troopship and writes of his gratitude to the Red Cross who kept the men supplied with writing material, cigarettes and luxuries such as fruits throughout their journey. He talks of the activities on board including cricket and other sports and describes the Anzac Day commemorations on a troopship in 1919. With Anzac Day approaching I thought this might provide an opportunity commemorate the service of soldiers such as Campbell and to provide a peek into a soldier’s voyage back to the place he was fighting for all along – home. You can read the transcript of Campbell’s diary online here.